A lot happened during these weeks ashore. I officially became Henrietta, with new documents, new labels and new bits. My decks were cleaned and tidied. A layer or two of polish and lots of smart anti-fouling were applied. 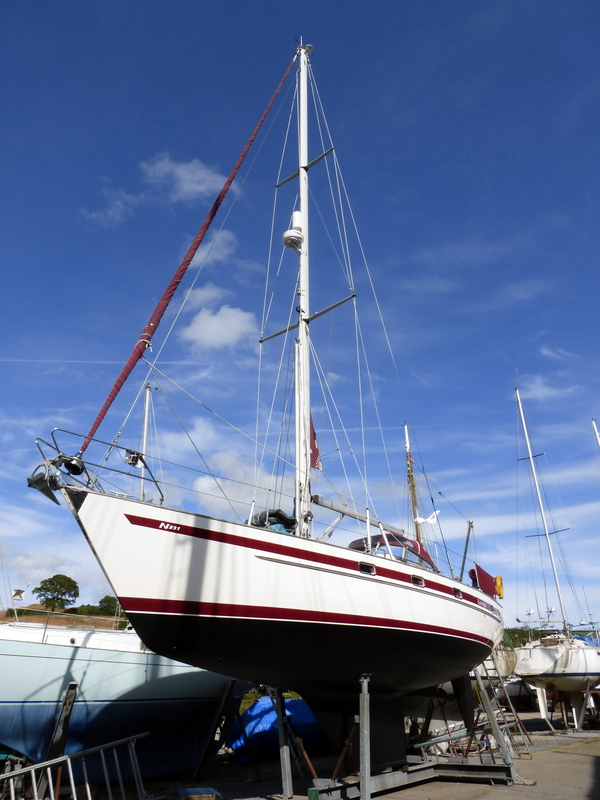 Engine serviced, electrical bits, a new solar panel, more handholds…….. You may not be interested in these details but they mean a lot to me, and boat owners know how long and pricey these lists can be! Finally, I’ve been loaded with a mass of spare parts, tools, even more charts and books and clothes for M, and food and drink and……It makes a boat feel overweight…. though my figure is as fabulous as ever. We know people who spend years getting ready for sailing adventures like ours, but skipper is a bit impatient, and he hasn’t spent much time pondering the details of what he plans to put me through. (Men can be like that). Anyway, we’re going to leave soon, and just see how we get on. If it doesn’t work out, we think we may be home for Christmas. This entry was posted in 2015 England to Cape Verde, Older Posts on 26 August 2015 by michaelsweet50.